January 2018: Best Date Ideas in NH? Date Night in the Pottery Studio! Thanks, WMUR voters. We agree. January 2018: Boston Voyager shares “Inspiring stories” of real people in the greater Boston Area. Here is an interview with founder Monica Leap about the story behind the studio. August 2017: Monsters on the Loose selected as one of the “10 Best Free Events in August” by NH Magazine and highlighted in the Union Leader’s “Scene in Manchester” by Katie Mcquaid. August 2016: James Chase of the Think Outside the Box Program is highlighted in NH Magazine. July 2016: Best of NH Magazine Editor’s Pick for Best Art Classes. July 2016: “Change through Art” from the Hippo Press about the “What it means to be Trans” exhibition. It was also highlighted in GoodGood Manchester. June 2016: A “Think Outside the Box” highlight on the Hippo Press. June 2016: WMUR-9 did a clip on the Think Outside the Box Project. June 2016: Outside In, Graffiti Art in the Gallery, a partnership show between Top Shelf Tattoo Gallery and Studio 550. Here is the article in the Hippo. May 2016: “On the Job” Interview with Monica Leap in the Hippo. May 2016: Interview on Citywide Blackout! A blog/radio show about arts and entertainment in New England. May 2016: A Union Leader article about the NH Business in the Arts Awards. Monica and Theresa were demonstrating artists at the opening reception. April 2016: A guest blog post by Lauren Smith with Stay Work Play NH about taking a pottery class here. February 2016: VacationIdeas.com 16 Best Things to do in Manchester… Studio 550 is one of them! Stop in for a workshop! 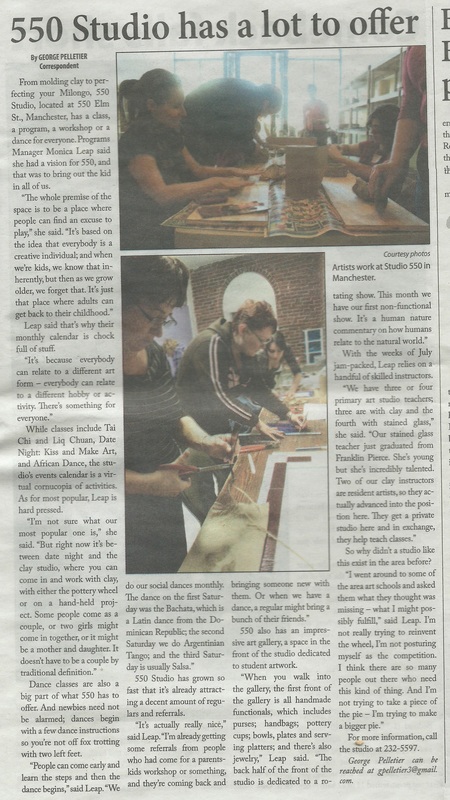 We were recently featured in an article about Studio 550 Art Center Builds Community Through Creativity. If you’re interested in New Hampshire Real Estate, check out some of what they have to offer for Manchester, NH Real Estate. July 2015: Best of NH Editor’s Pick for Best Art Studio. Read about the local art scene here. March 2015: “Talking Terrariums” in the Hippo covers our Succulent Terrarium series. March 2015: Pie Day in the Press: Pie Day, a Pie Competition between Professional NH Bakeries was mentioned in the Union Leader by Katie McQuaid (Pi, by any other name, just as sweet) and “Celebrate Pi Day with Pie” in the Hippo by Allie Ginwala. The results were highlighted in the Nashua Telegraph. November 2014: Celebrate “Everyday Art” with the Annual Cup Show & Sale and the Handmade Holiday Market! August 2014: Monsters on the loose…Again! The Union Leader’s Katie McQuaid is spreading the good news about Monsters taking to the streets. May 2014: Hooray for Businesses that support the Arts! Another Hooray for the NH Business Council for the Arts, which celebrates them. Learn about the NHBCA awards banquet in the Union Leader. We were a demonstrator there. May 2014: Learn about the 1st NH Statewide High School Clay Challenge! The Hippo interviewed the students for this fantastic article. We also had a little blurb in the Music Round Up about our 1st ever All-original Open Mic night. February 2014: Katherine Gardner of the Nashua Telegraph wrote this about the “Think Outside the Box” Traffic Signal Box Public Art project, Katie McQuaid of the Union Leader wrote this in January, and the LivableMHT Blog wrote Infrastructure as Canvas in December. Hopefully, this project will make downtown more unique and will bring art to everyone! February 2014: Learn about Double Date Night! in the Nashua Telegraph. January 2014: We are on the cover of Manchester Advantage, and a wonderful article by Mclean Communications starts on Page 35. December 2013: Food writer Emelia Attridge from The Hippo Press wrote about the opening of our Tea Room. November 2013: The NH Chronicle, highlighted the studio for the evening TV show. Here is the 7-minute feature. Fall 2013: The Article image is from the Nashua Telegraph. August 2013: The Nashua Telegraph published 100 red clay monsters loose in Manchester!, Katie McQuaid of the New Hampshire Union Leader wrote “Monsters Bearing Chocolate” and NH.com wrote Find Monsters in Manchester about our summer monster search. We partnered with the Dancing Lion Chocolate shop for the second batch of Monsters in the summer of 2013. 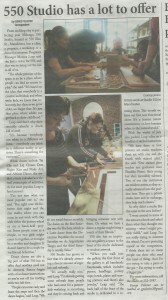 December 2012: Kelly from the Hippo Press writes about our grand opening! A copy of the article will be uploaded soon.